Amitāyus is considered to be a manifestation of the Enjoyment Body (Sanskrit: sambhogakāya) of the Buddha of Infinite Light; i.e., Amitābha. Though strictly speaking Amitāyus is an emanation of Amitābha, yet both are in fact one and the same Buddha, differentiating from each other only in terms of their iconographical depictions. For instance, Amitāyus is depicted with a treasure vase in his hands, containing the elixir which bestows immortality (Sanskrit: amṛta). Indeed, the Sanskrit words amita (‘infinite’) and āyus (‘life’) designate Amitāyus as the Buddha of Immeasurable Life. 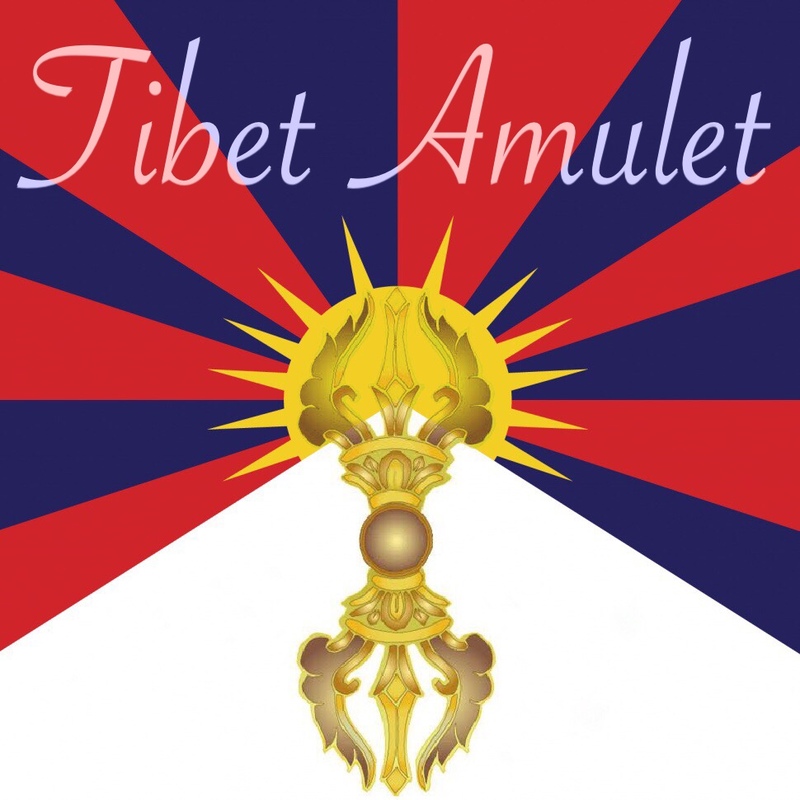 The front face of the amulet features an image of the celestial Buddha based on traditional Tibetan Buddhist iconography. 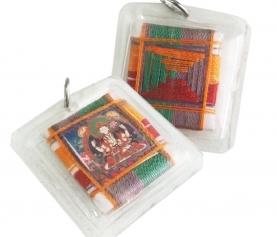 The picture of the Buddha is placed in the center of a cosmic diagram (Sanskrit: maṇḍala) made from sacred thread. 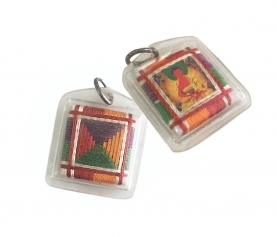 On the locket’s rear face we can see that the patterns are woven in a particular fashion to match the colors of the cardinal directions. 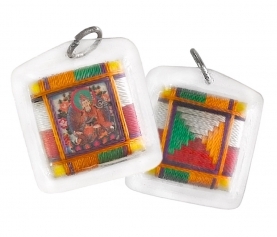 Moreover, to protect the sacred contents from external damage, the amulet is wrapped in a special case. 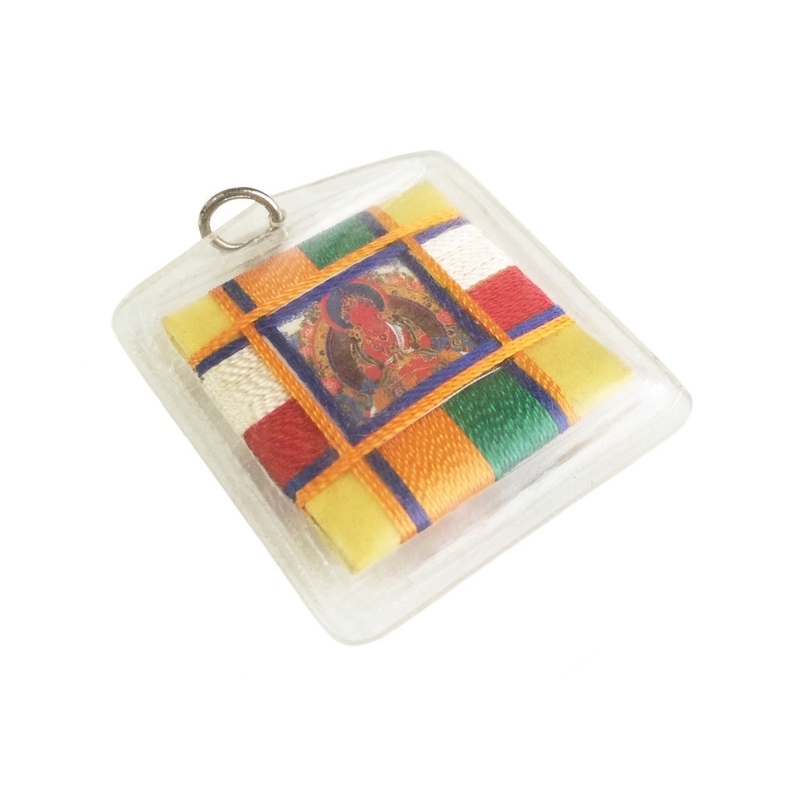 Wearing or carrying this so-called sungkhor locket, along with daily recitation of the aforementioned mantra, is believed to help one gain good health and longevity. 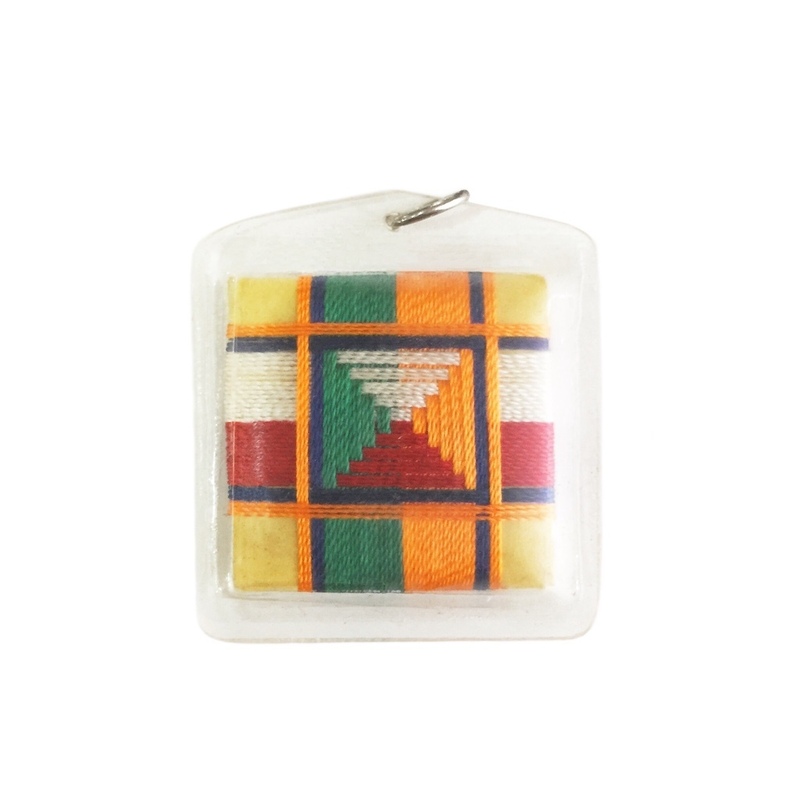 In addition, this Tibetan esoteric item also serves as a means for spiritual development, allowing the wearer to rejoice in the immeasurable merit which can be acquired by paying homage to Amitāyus and/or Amitābha. 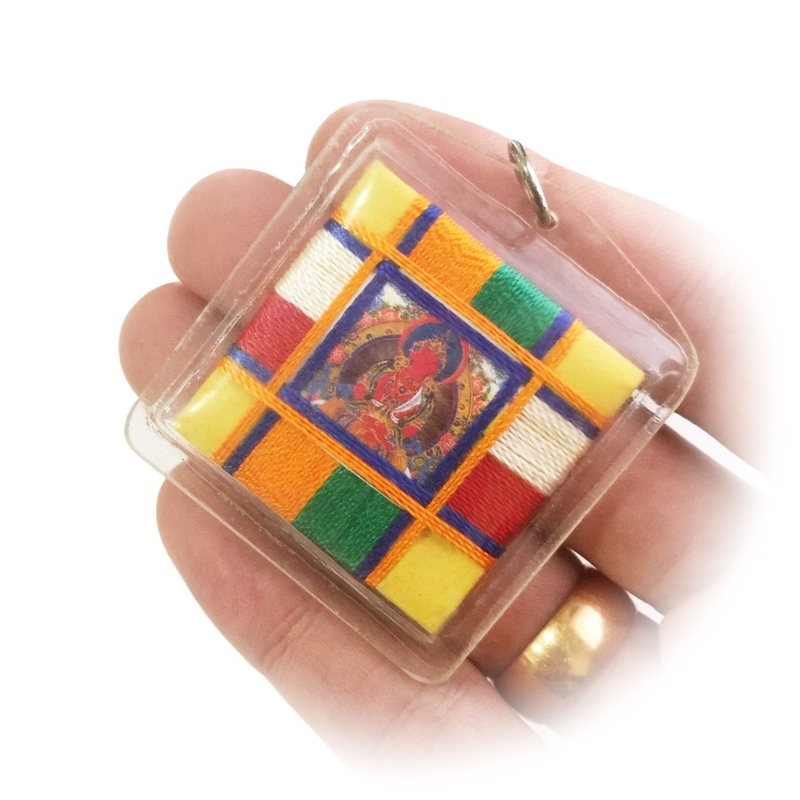 Thus, apart from the potential attainment of long life in this world, using this particular amulet to perform meritorious deeds can also lead to favorable conditions in the next. In other words, one will be able to take rebirth in the Western Paradise or Pure Land (Sanskrit: sukhāvatī) where this Buddha resides.